Dr. Doundoulakis is a trained specialist in prosthodontics, a branch of dentistry that includes implant tooth replacement and cosmetic dentistry and rehabilitation. He specializes in the rehabilitation of damaged and missing teeth in both the young and mature dental patient. With extensive experience and training in the most modern state-of-the-art techniques, Dr. Doundoulakis can restore even the most challenging esthetic problems into beautiful smiles. He practices in Old Greenwich, Ct and in New York City. Dr. Doundoulakis is currently Director of Implant Prosthetics, Mount Sinai Medical Center, where he offers the Residents all their lectures on implant tooth replacement and maxillofacial prosthetics. In 2013, he was the President of the New York County Dental Society, one of the oldest Dental Societies in the country, founded in 1868. He is also the former Assistant Clinical Professor and clinical attending at New York Hospital – Cornell Medical Center in New York City and Assistant Clinical Professor at the Columbia University of Dental and Oral Surgery and the New York University School of Dentistry. 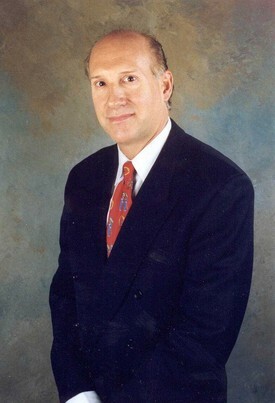 In October 2012, he was inducted as Fellow of the International College of Dentists, in addition he is a Fellow of the American Academy of Maxillofacial Prosthetics (1986), the Greater NY Academy of Prosthodontics (1987), the International Academy of Dental Facial Esthetics (1999), the New York Academy of Dentistry (1994) and the Academy of Osseointegration, the world’s most renowned implant organization, which is dedicated to the advancement and development of the highest standards of dental implant treatment. Dr. Doundoulakis served on the Board of Directors for seven years and completed his term as President of the Academy in 2002. Dr. Doundoulakis graduated from the University of Pennsylvania where he received his dental degree, Doctor of Dental Medicine, from the School of Dental Medicine and a Masters in Educational Leadership, concurrently, at the Graduate School of Education. He was elected Class President of his dental school class all four years. 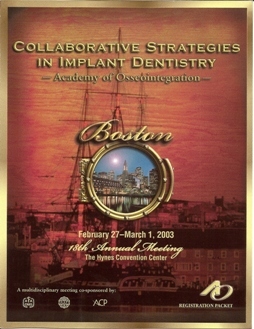 After a one-year residency at the St. Luke’s-Roosevelt Hospital Center in New York, he completed a two-year postdoctoral fellowship in prosthodontics at the Harvard University School of Dental Medicine-VA program in Boston, MA, specializing in removable, fixed prosthetics, cosmetic dentistry, and dental implant reconstruction. Dr. Doundoulakis then completed his sub-specialty training in maxillofacial prosthetics at Roswell Park Cancer Center in Buffalo, NY, where he completed research on the surface analysis of titanium- the metal most commonly used in successful dental implant systems. He won acclaim from the specialty and the profession for this work and received several major honors. Including First Prize in The American Academy of Maxillofacial Prosthetics Research Competition and finalist in the John Sharry Research Competition of the American College of Prosthodontists. Dr. Doundoulakis has spoken before every major prosthodontic and implant organization in the world! He has written several articles on dental implants and cosmetic dentistry and is a co-author of THE PERFECT SMILE, a consumer’s guide to cosmetic and implant dentistry. His work and career has been reported in many newspapers and magazines. Dr. Doundoulakis is former Associate Editor of Esthetics and Implant Dentistry for the Journal of the American Dental Association, the world’s largest and best-regarded journal and resource for the dental profession. Dr. Doundoulakis is a Fellow of the American Academy of Maxillofacial Prosthetics (1986), the Greater NY Academy of Prosthodontics (1987), the International Academy of Dental Facial Esthetics (1999), the New York Academy of Dentistry (1994) and the Academy of Osseointegration , the world’s most renowned and largest implant organization dedicated to the advancement and development of the highest standards of dental implant treatment- where he was on the Board of Directors for seven years and completed his term as President of the Academy in 2002! For information on dental implants, Visit our e-Book on dental implants. James Doundoulakis, DMD, MS, is an experienced cosmetic dentist and a leader in the field of Prosthodontics, a specialty of dentistry devoted to enhancement and replacement of teeth. A pioneer in the exploration of new dental technologies, he has been awarded several research prizes for his innovative work with dental implant metals. 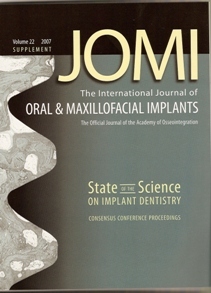 In 2008, Dr. Doundoulakis helped organize and contributed to the world’s first Consensus Conference on State of the Science on Implant Dentistry, the proceedings of which were published in the prestigious medical journal, The International Journal of Oral and Maxillofacial Implants. 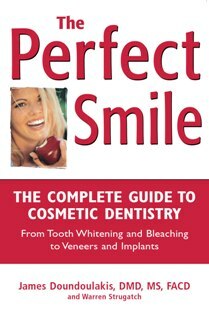 Dr. Doundoulakis is the co-author of the popular consumer reference book, The Perfect Smile: The Complete Guide to Cosmetic Dentistry, which received favorable reviews by the New York Times. In addition, Dr. Doundoulakis had one of his “extreme makeover” patients featured on ABC TV’s The View. Dr. Doundoulakis has also been featured in The New York Sun newspaper, Health, American Baby and Avenue magazines. Dr. Doundoulakis has published many clinical and research articles on implant tooth replacement and cosmetic dental procedures in several dental journals, including the Journal of the American Dental Association and Practical Procedures and Aesthetic Dentistry. Dr. Doundoulakis combines his talent and experience with technological expertise to deliver cosmetic dentistry treatments that are both natural and durable. He is one of the few dentists in Manhattan to offer the GlamSmile™ –CADCAM system for manufacturing computer-generated all-porcelain crowns, inlays and veneers. He also offers the GentleWhite™ Belgian power bleaching system, which utilizes a special light and a unique whitening gel product that minimizes after-treatment sensitivity. Dr. Doundoulakis’s office features many other leading technologies and materials, including Invisalign™ removable orthodontic aligners and Lumineers™ porcelain veneers. The office is also equipped with intra-oral television cameras and video screens, digital radiography and x-ray equipment and laser tooth decay detection devices. Dr. Doundoulakis served as president of several dental organizations, including the Eastern Dental Society, the American Society for Laser Medicine and Surgery and the Hellenic American Dental Society. Dr. Doundoulakis is currently VICE PRESIDENT and on the Board of Directors of the New York County Dental Society. He also served on the New York Hall of Science Advisory Council, the Citizens’ Committee for Children and the Community Board 8 in Manhattan. In addition, he spent five years as Crew Chief for the United States Anti-Doping Agency, an arm of the United States Olympic Committee. Dr. Doundoulakis is a specialist in Prosthodontics, cosmetic dentistry rehabilitation, implant tooth replacement, cosmetic dentistry, prosthodontics and dental implants. This specialty deals with the rehabilitation of individuals with some or all of their teeth missing – in both the young and the mature dental patient. With extensive experience and training in the most modern state-of-the-art techniques, Dr. Doundoulakis can restore even the most challenging cosmetic problems into beautiful smiles. St. Luke’s – Roosevelt Hospital Center. 1988 to 2002. Visiting lecturer, Post-Graduate Prosthodontics and former Assistant Clinical Professor, Dept. 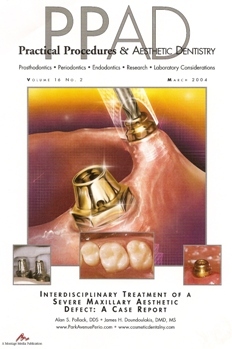 of Prosthodontics and Occlusion.1986 to1989. 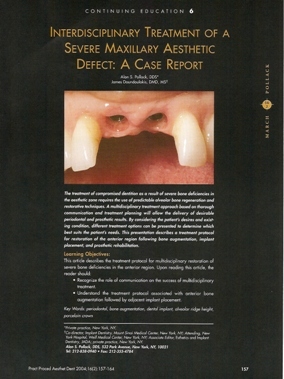 Associate Editor, Esthetics and Implant Dentistry, Journal of the American Dental Association. 2002 to 2006.